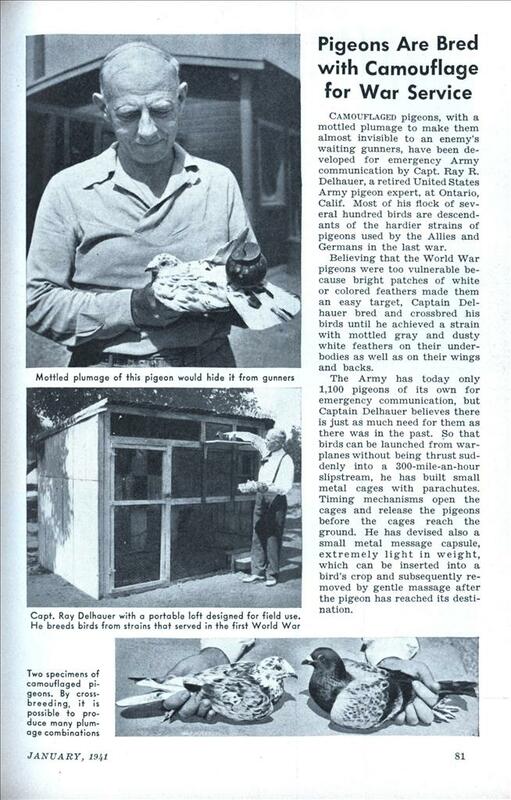 Camouflaged pigeons, with a mottled plumage to make them almost invisible to an enemy’s waiting gunners, have been developed for emergency Army communication by Capt. Ray R. Delhauer, a retired United States Army pigeon expert, at Ontario, Calif. Most of his flock of several hundred birds are descendants of the hardier strains of pigeons used by the Allies and Germans in the last war. Believing that the World War pigeons were too vulnerable because bright patches of white or colored feathers made them an easy target, Captain Delhauer bred and crossbred his birds until he achieved a strain with mottled gray and dusty white feathers on their .under-bodies as well as on their wings and backs. The Army has today only 1,100 pigeons of its own for emergency communication, but Captain Delhauer believes there is just as much need for them as there was in the past. So that birds can be launched from war-planes without being thrust suddenly into a 300-mile-an-hour slipstream, he has built small metal cages with parachutes. Timing mechanisms open the cages and release the pigeons before the cages reach the ground. He has devised also a small metal message capsule, extremely light in weight, which can be inserted into a bird’s crop and subsequently removed by gentle massage after the pigeon has reached its destination. This seems far-fetched to me. 1. Camo makes sense when looking down from above; it blends with the earth. When looking up at the sky, you’ll easily see the bird. 2. 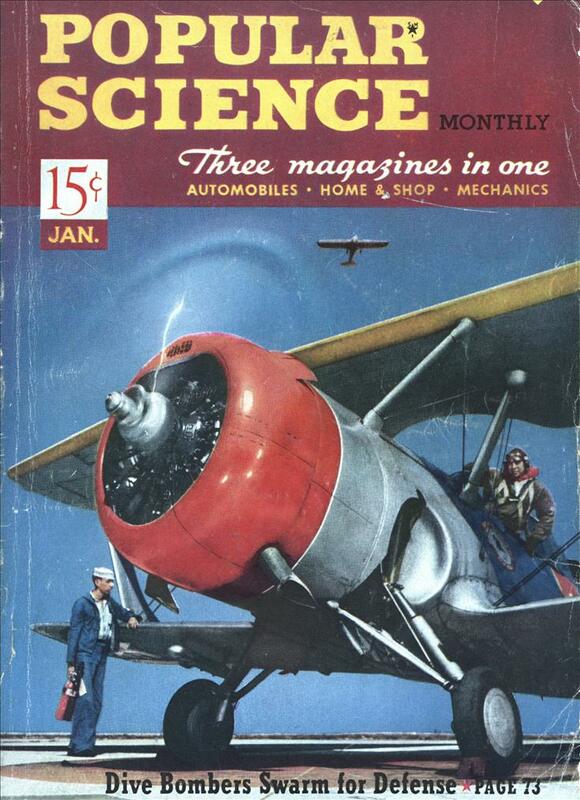 The bird’s flapping motion catches they eye; a light-colored aircraft might not. here’s an email that I sent to a pigeon breeder in hope of an answer, “Junior” the baby pigeon on my balcony has continued to grow but seems to be traumitized as far as being able to fly away, this might be due to having watched his sibling carried off by a black crow. What if anything can I do to help Junior? Perhaps you could forward this to Captain Delhauer, I would love to get his opinion on my situation. Regards, TZ. I came across your site on the web and found it most helpful. I live in ,NYC. I have a baby pigeon on my balcony, his parents gave birth to him and his sister/brother? about a month ago, the parents have left because they wanted to put another egg in the flower pot that Junior was reared in, but Junior doesn’t seem quite ready to leave the flower pot that he was born in. I think his sibling was carried off by a crow so this has gotten Junior traumatized. Any pigeon that lands on the balcony now is accosted by Junior to feed him. I put out some bread and some rice krispies for Junior, but he’s not aware of it as food yet, he’s still looking for “home cooking”. He’s probably hungry, but I don’t know what to feed him, and I’m worried that if I do feed him, this will delay the leaving the nest process for him. Any suggestions? enclosed are some photos of Junior and his family. Regards, Todd Zornow.